We’re going beyond the edges of the project in this post, to look at a passenger crash and its aftermath. This week it’s the anniversary of the Ulleskelf accident, which took place on 24 November 1906. It killed two railwaymen, the driver and fireman of the express train that ploughed into the back of a stationary coal train, but was notable not for their deaths – of course – but because it placed issues of public safety centre stage. The deaths of driver Dunham and fireman Edward Booth fall outside the period our project currently covers, but even had they fallen within the 1911-15 window, they wouldn’t have appeared in our database. This is because they were involved in an accident to a passenger train, and these accidents are, generally, much better known and already publicly available via the Railways Archive website. By way of contrast, the accidents which feature in our database are relatively unknown and (until our project) more difficult to get hold of than the passenger crash reports. The flipside – in this case – is that because Dunham and Booth were killed in a passenger crash, their accident was subject to a much more extensive investigation than they might have received had it ‘just’ been a worker accident. All passenger crashes were investigated, in great detail: this was possible as there were so few of them (despite perceptions to the contrary in the 19th century). Politically it was necessary to investigate all passenger crashes, too, as travellers had no control over the safety of their journeys and so were held to be innocent victims. So instead of receiving either no formal state investigation (the situation for around 97% of all worker accidents) or a short investigation (typically half a page long), the report into Dunham and Booth’s accident ran to over 9 pages and included copious eye-witness testimony. Much of the report’s detail is technical, including the detailed discussion of the prevailing conditions and the distances at which various people involved thought it possible to see signals set at ‘danger.’ Without Dunham and Booth’s testimony it is of course impossible to be sure exactly what happened, but Inspecting Officer Lieutenant Colonel PG von Donop (incidentally, godfather to PG Wodehouse) was able to come to some conclusions. Dunham and Booth were crew on the 7pm York to Leeds express; they were 9 minutes late leaving York. There was a variable amount of fog in the Ulleskelf area, though none of the signalmen involved felt it sufficient to warrant calling out fogmen. Still, combined with the dark of night there were serious questions about visibility, though not, von Donop concluded, sufficient to exonerate Dunham and Booth entirely, as they ran through several signals set at danger. The station, just to the south of the accident site, as it appeared in 1906. We have some indication of the urgency – and no doubt fear – felt in Ulleskelf signal box when it was realised that the express train was on a collision course with the goods train. 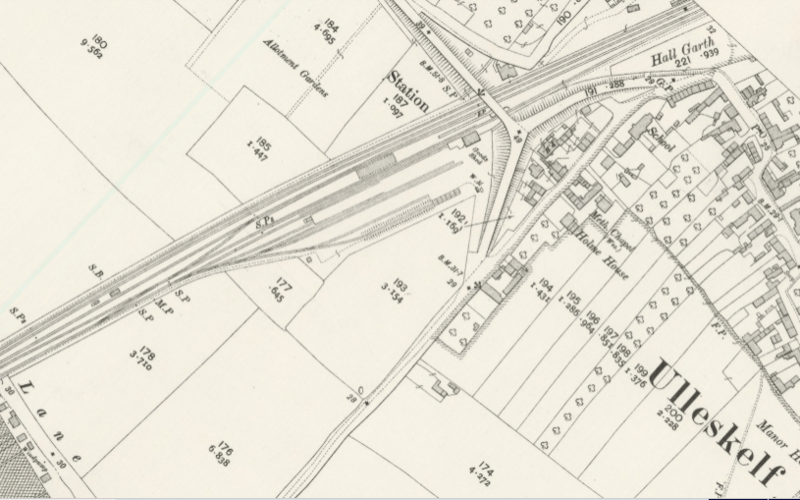 The goods train guard, William Hill, had gone to the signal box, as he should have done under the circumstances – and a move which probably saved his life when the trains collided, as the body of the brake van was completely destroyed. He was there when the call came in from the Bolton Percy signalbox, to the north: ‘When I was in the box the signalman told me that the Leeds express train had run past all the Bolton Percy signals at danger … He told me to get sharp out and take a red light down the line. I did so, and I got about 30 yards before I met the express. I held up my red light waving it from side to side.’ Whilst it might have had an effect – Dunham or Booth appeared to apply the brakes, reducing the speed to around 30 mph – it didn’t prevent the crash. 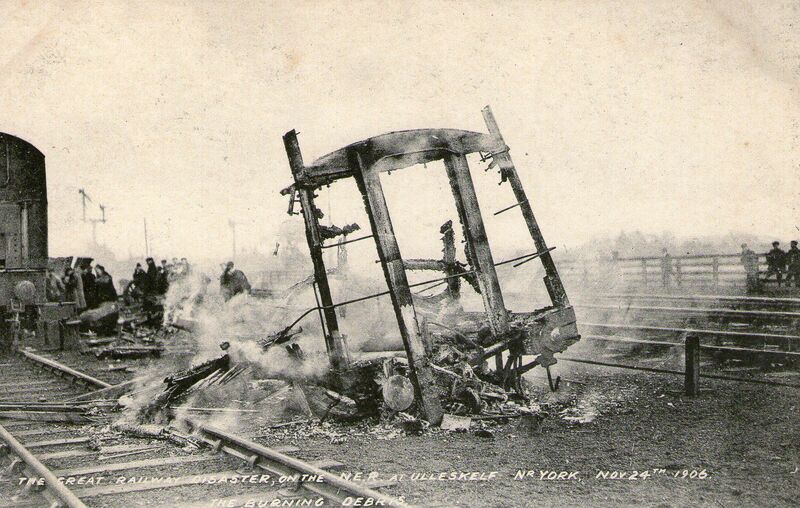 Postcard issued following the crash. In the investigation, anything that might have been material to the case was considered – including, of course, the characters of Dunham and Booth. Dunham, who had worked on the railways for nearly 40 years, was noted as ‘a thoroughly capable driver, well up to his work in all respects. I can give him the best possible character. He was a temperate man, and a teetotaller, and I regarded him as a thoroughly trustworthy driver.’ Booth, with 9¾ yrs service, was felt ‘well up to his work, and I can give him quite a good character.’ Von Donop concluded that smoke and steam from another passing train might have been involved, but even so, Dunham and Booth ought to have proceeded with greater caution. The public accounts which exist of the crash tend to make a straightforward link between this accident and the introduction of technical fixes intended to prevent crashes such as this – things like Automatic Train Protection, which would cut off steam/ apply the brakes if a signal was passed at danger. Certainly there had been experiments with this type of technology and variants for around 15 years. But there’s a danger with cases such as this, of turning the injuries and deaths of workers like Dunham and Booth into unfortunate but inconsequential details in a grand story of progress to ever safer passenger travel. That would be misleading anyway – to this day there are various different systems in place on the network, each doing different things – and it would hide the fact that railway staff have long borne the majority of the costs of railway accidents. In addition, whilst improvements designed to protect passenger trains have undoubtedly benefitted travellers, they also benefitted train crews – if only as a side-effect. Edward Booth’s headstone, Hull Western Cemetery. One of the reasons we wanted to discuss this case was concerned with its afterlife: the gravestone erected for Edward Booth, by his mother. 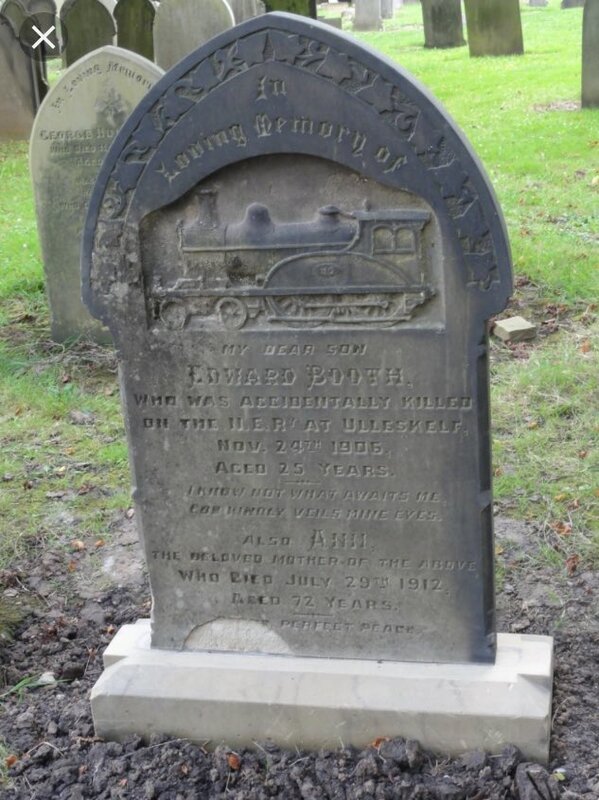 It is found in Hull, where Dunham and Booth were based; located in the Western Cemetery, it gives a likeness of the engine Booth was firing when he died and notes the accident that led to his death. It is relatively uncommon to have the ‘tools of the trade’ (especially by which he died) engraved like this; perhaps it was a tribute to the pride in his craft, or perhaps a rebuke to the North Eastern Railway, named if not fully shamed on the headstone. As a result of its significance, the gravestone has recently been listed by Historic England. We’re interested in further examples – plain or ornate – of gravestones for railway workers killed in accidents, so if you’re aware of any do please let us know. As we’ve been reminded earlier this month, with the centenary of the end of the First World War, how and why we remember, as well as who we remember (and who we forget), is important. Looking at how railway worker accidents were portrayed on gravestones can help us gauge the place of these accidents in wider society.